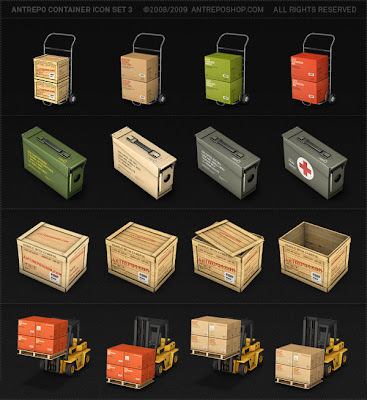 New Container Icon Set from Antrepo, another 40 icons about cargo boxes. Beautiful set of icons! Really good attention to details. Thank you for such a great contribution! Thanks for the great ammo box icons!!! I love the textures in this set! I like the "army style" boxes. Thanks for sharing, this is an high quality set of very useful icons ! Hi, Are they free for commercial use? You can't use it for commercial project without our permission. Please contact us for permission and pricing! Thanks!. Nice nice. Salud y suerte.